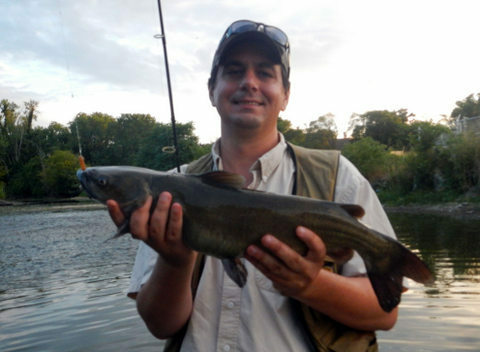 DuPage Angler Drifts His Way to Big Cats! Got an invite from DuPage Angler Pondboy yesterday askin' if I was up for some drift fishing on the Fox. It had been a while since I had drift fished live bait in a river and I'd never fished the Fox but I am always lookin for an excuse to fish and I figured PB would be a good guide. As you can imagine with the drought conditions we have been under, the river was very low, as low as PB had ever seen it at this location. This required a shallow presentation and most of the trip we only had our nightcrawlers set 1-2 feet below our floats. We fished for awhile with a few smallies and cats. As we began to slowly wade our way back up river and call it a night, I watched my float disappear. As I set the hook I could immediately tell I had a bigger fish than what we had been catching. After a good battle I landed this channel cat, the biggest of the trip. This fish was a blast to fight on light spinning gear and only 6lb test line. Congrats Sooner on the COTD! Great job. Great cat and a hearty congrats on your COTD!!! Two great cats from the Fox in a week. I don't want to jinx it but I wonder when the cat bite is going to slow down. I'm loving fighting 'em but I miss multiple smallies in a trip. Thanks Marty, and a double COTD to boot! Thanks for the great Catch Of The Day Sooner Bass!